Here’s a viewer submission by Henry. I thought it was a great tip so I wanted to share it with you folks. Hi Mark, since you are promoting ‘safety week’ at the moment, I thought I’d share a simple piece of router safety for a beginner. We’re all aware of avoiding climb-cuts, it’s one of the first router operating procedures we learn right after ‘don’t touch the spinning bit’ – yet I still managed to do it accidentally. My router came with a small bench-top router-table, which works ok. It also has a big arrow on it to show which direction to feed the wood to prevent a climb-cut. So far so good – so how did I fail? I had just cut a groove in a piece of wood, and saw that it hadn’t quite cut to the line I was looking for, so I moved the fence forward about 1/16″ and ran the wood through again. You experts know exactly what happened next. By moving the fence forward – towards the bit while cutting a groove – I was now cutting with back edge of the blade, and despite feeding the wood in the direction of the arrow, this was a climb-cut. My piece of wood shot across the garage like a bullet, and the bit bent like a banana. If you look closely at the photo of the bit, you will see a few pieces of the steel cutting blade also broke off – I have no idea where they went, but that is another reason I wear eye-protection. So, did this ever happen to you? I can think of a number of times when I forgot about this and paid the price. Definitely something to keep in mind when making multiple passes at the router table. I had a similar incident trying to true the edge of a strip of wood. I was pressing down on the workpiece for stability(with my hand). As the bit grabbed the wood it shot through and pulled my hand across the bit. It could have cost me a finger. still, it was a bad cut/tear. I haven’t repeated that one. Sadly, I’ve had two friends from local woodworking clubs do exactly what Henry describes, but with more serious injuries. I’ve only had it happen once, with no injuries, luckily. So what is the remedy? I don’t use a router for much of anything, so I’m not sure what is being described… or how to avoid it when I need to increase the depth/width of a groove. Thanks. If you don’t understand what is being described, then you might not understand the remedy either. But instead of pulling the fence toward the bit, I would push it away just a bit, turn the workpiece 180 degrees and run it that way. This would ensure that the cutting action is happening in front of the bit, and not behind. I am new to woodworking as well. Although I have not experienced this problem, I now know how to prevent it. I have had the problem with a bit rising. It was tightened down as tight as I could get it, but it still rose in the wood while I was cutting a groove. Is this a bad bit or should I look for some other solution? This has not happened with any other bits, but I have not used the router much. Hard to say without being able to inspect the bit. But if it happens with any other bit, you know it’s probably an issue with the collet. That’s something to be very cautious about. This post of the router climb cut mishap reminds me of the day I let my neighbor borrow my router table. He had plenty of tools, even a router. I figured for sure he knew what he was doing. He talked the talk, why not. So a while later he came over and asked me how to prevent the wood from flying off the table once he started his cuts. Turns out he missed the BMW in the driveway by inches! I went over to see what the heck he was talking about and saw that he was feeding the wood through BETWEEN the fence and bit! Yikes. 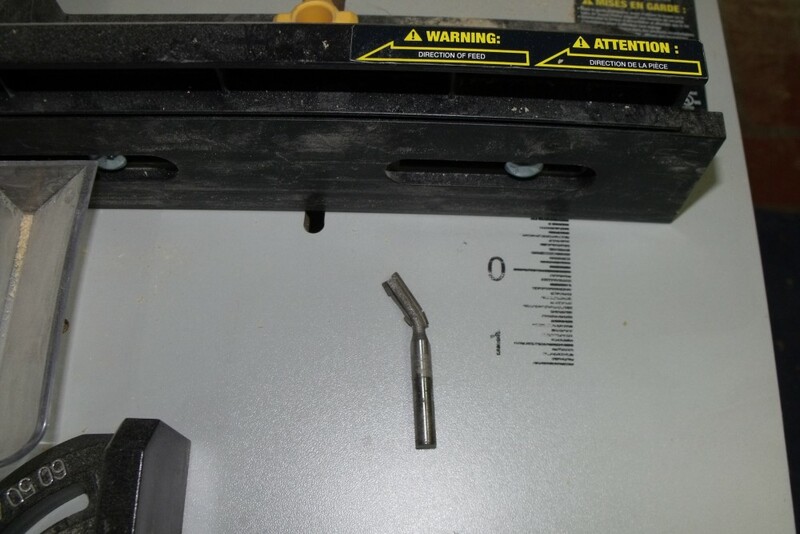 Moral of the story…make sure people borrowing your tools know how to use them first, or don’t lend them out at all. Wow. That explains a lot. I’m a 54 yr. old woman trying to learn woodworking by myself. I was testing my new router/table. Learning how to change bits, adjust fence, line up pieces and run wood through. It grabbed the wood out of my hand, shot it across the garage like a bullet (twice). I wasn’t sure why. I thought I had the bit set at the wrong height. Luckily the only blood resulted from the wood giving me a small cut as it moved through my fingers. I did the exact same thing last weekend. Funny thing though is that I told myself the entire time to not do it. I knew exactly what was going to happen, but I did it anyways. I wasn’t surprised at all when the board shot off like a missile. Wow! scary stuff. My wife bought me a router for Christmas, it is my first true piece of wood working equipment, other than drills and hand tools. I have not opened it yet. Now I think I better do some reading on how to safely use it first. Any suggestions? Watch a good DVD on router use. Tauton Press has some good ones. Router Joinery is one. It will teach you different techniques and how to use the router. Books work too, but if your like me, you’ll pick up a lot by just watching. Keep two hands on it and make multiple passes/small cuts to achieve your end result. good luck. I did the same thing. I was routing a samll piece and had my finger on top of it (I couldn’t have done more things wrong). I knew what I was doing was incorrect but I did it anyway. The piece flew across my garage and stuck into the drywall on the other side. When I looked down I could almost see the bone in the end of my finger where the middle of the nail used to be. No surgery just a lot of pain and about 8 months to completely heal. I got lucky but it makes me think about being safe before I turn on any machine in my shop now.